Last night Calvin and I walked over to our local TDS and luckily, we snagged two seats at the bar instead of waiting in the incredibly long line. 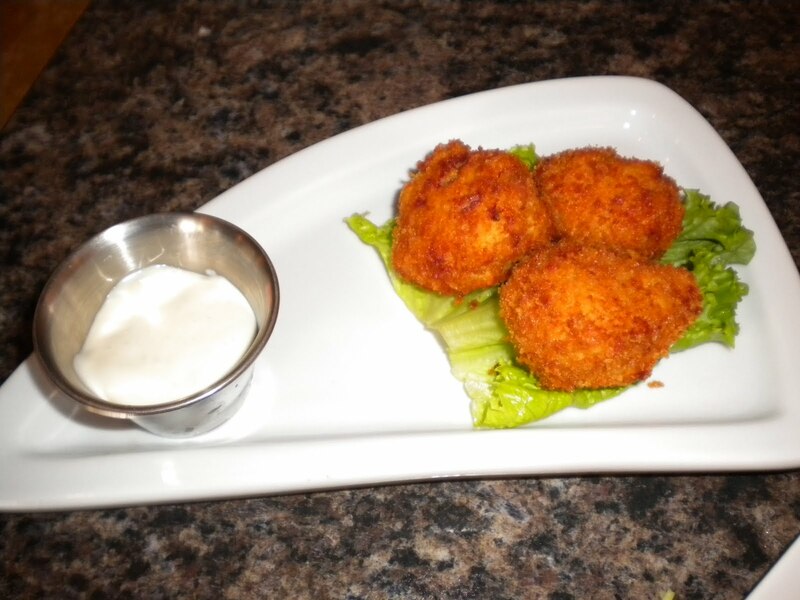 We also tried one of the special chile rellenos made with New Mexico chiles, available for a limited time only. Truly delicious. Ours tasted quite spicy, which I like, but the bartender said that some are not so spicy, you just never know. The restaurant is offering a special chile event also, details below. 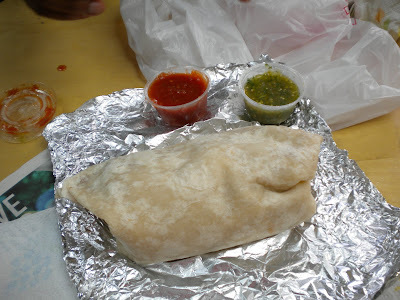 ATLANTA (Aug. 3, 2010) – Taqueria del Sol is known for fresh and unique cuisine, and a large shipment of Hatch chiles with the restaurant’s name on it only reinforces that image. 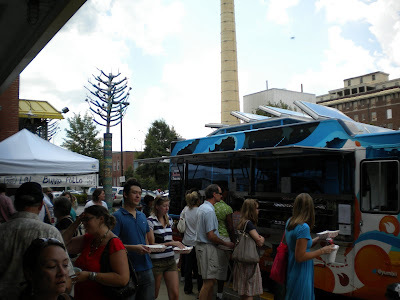 On Sunday, Sept. 12, the shipment will be opened and hundreds of chiles will be served in a variety of dishes for patrons, including crispy green chile rellenos, green chile cheeseburger sliders, green chile enchiladas and south by southwest brisket tacos. Held at the Howell Mill location, Taqueria del Sol will host a block-party sort of celebration spilling into the parking lot under tents, including various food stations, drinks and live music from 5:30 p.m. until 8:30 p.m. For only $12.00, patrons can enjoy all the food they can eat, and drinks will be available for purchase at the bar. 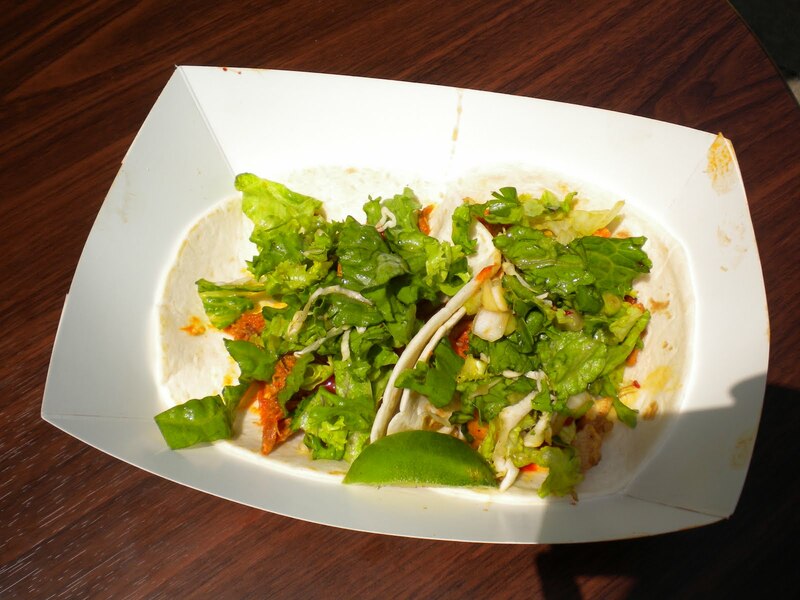 “Have you ever tasted a Hatch chile?” asks Mike Klank, owner of Taqueria del Sol. “No other chile tastes like a Hatch.” The chiles are named for Hatch, New Mexico, known as the “chile capital of the world.” Klank makes an annual event of the harvest, bringing in pallets of the spicy green peppers every year to roast at Taqueria del Sol locations. 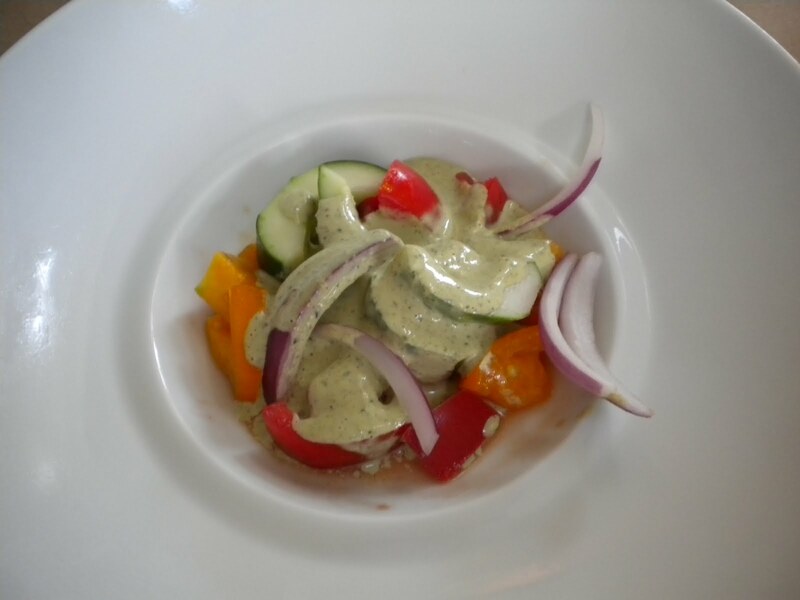 Chefs Eddie Hernandez and David Waller also incorporate the chiles in various dishes throughout the season. The event will happen rain or shine. A portion of the proceeds will benefit the Ossabaw Island Foundation, which oversees the public use and education initiatives of Georgia’s third largest barrier island, home to loggerhead sea turtles, endangered wood storks and other species in danger of extinction. WHEN: Sunday, Sept. 12; 5:30 p.m. until 8:30 p.m. This week I was invited to check out Yogurberry Frozen Yogurt and Smoothies (local site and worldwide site) in Buckhead's Terminus building. 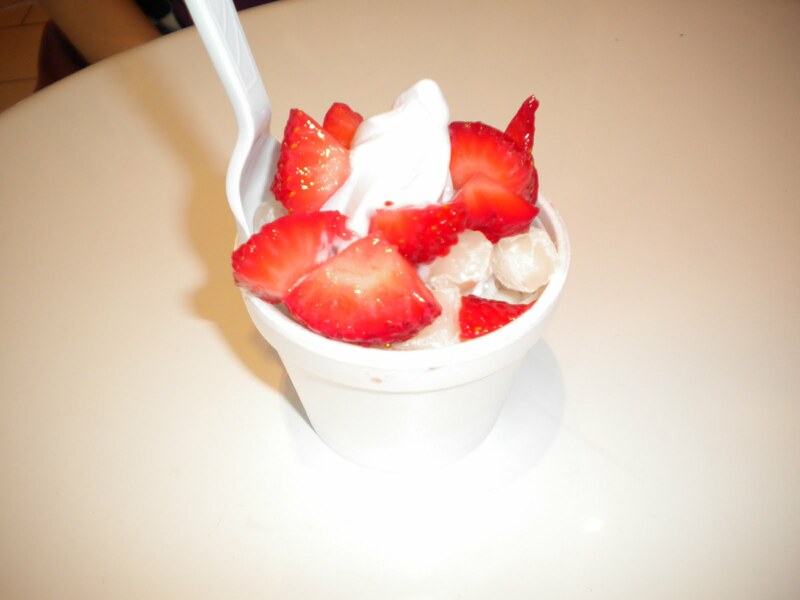 A friend and I were treated to several samples of this store's tart yogurt. Current flavors include plain, chocolate mocha, blueberry and taro, and the flavors change regularly. 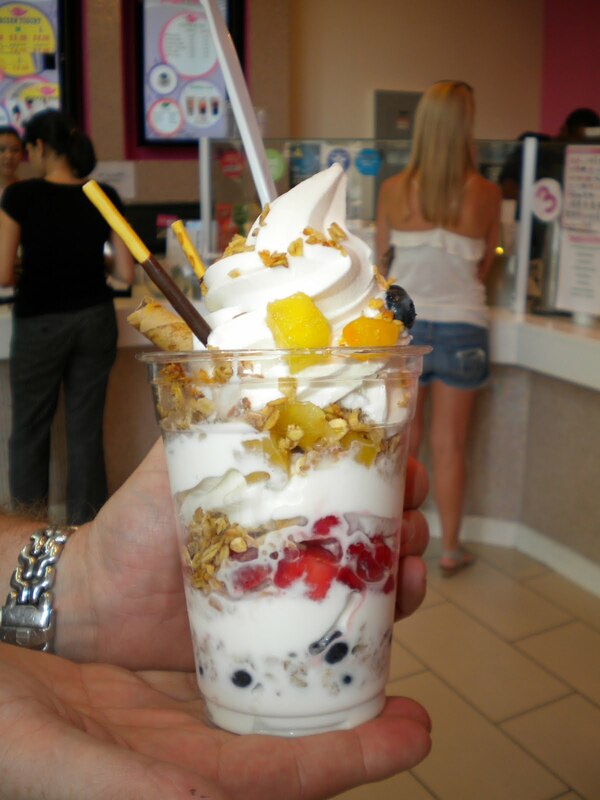 Yogurberry has several unique features when compared with the many yogurt shops popping up around town. 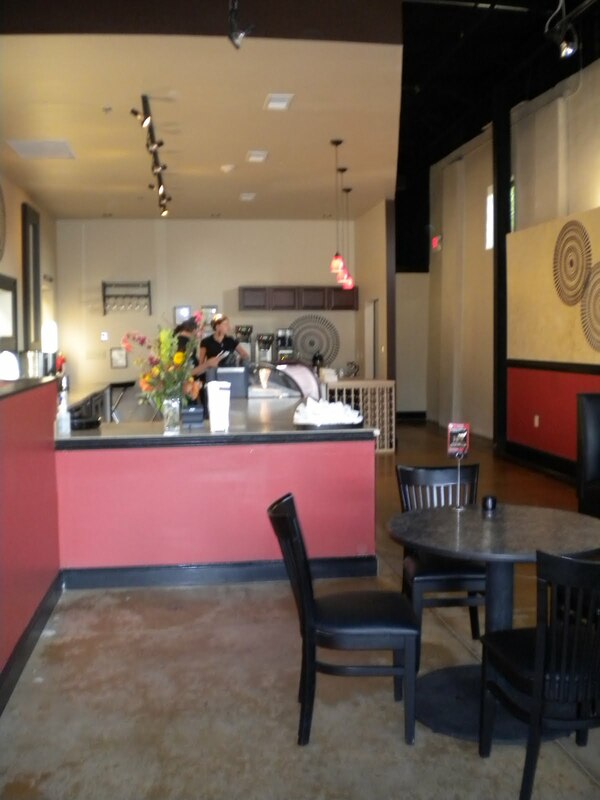 For one thing they offer a variety of smoothies, hot drinks and bubble tea in addition to the yogurt. In addition, they offer a granola parfait (pictured above) and a variety of other drinks. I also like the homey touches: hand-made signs and topping combination suggestions including owner Brian Hah's "Brian's Special". The yogurt here is quite tasty and apparently is made in-house. I liked the plain and taro flavors the best - in my opinion chocolate does not pair well with the tart yogurt taste and the blueberry was a bit sweet for me, but still delicious. They have many different and unique toppings here, including Pocky, mochi, a variety of cereals and tons of fruits and candies. I absolutely loved the avocado shake with bubbles (tapioca balls) added in. Wow - this could definitely be lunch and as it is not too sweet, probably a pretty healthy one. I will be back for that shake and recommend this place for a good, unique yogurt fix. Parking is validated for up to 3 hours. 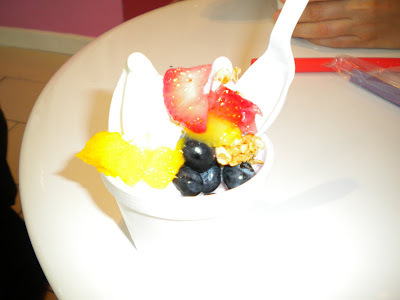 Plain & blueberry swirl with strawberry, mango, granola and blueberry. Taro with Strawberries, mochi and coconut - these flavors so very well together - you have to get a taste of each in one bite! 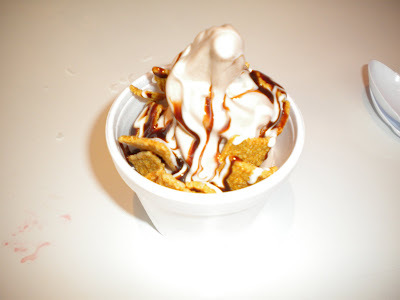 Chocolate Mocha yogurt with marshmallow creme, chocolate sauce and Golden Grahams - Yogurberry's homemade s'more. 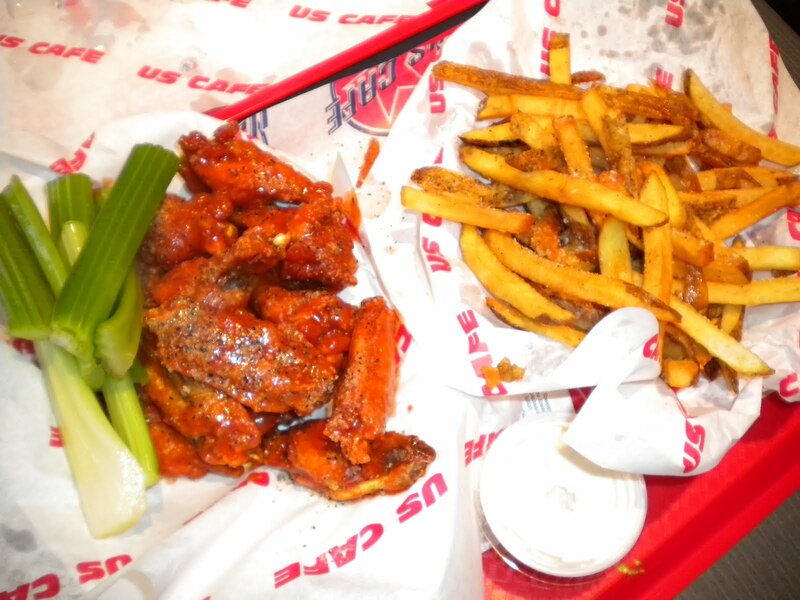 Hot wings with lemon pepper and fries - Special #3. 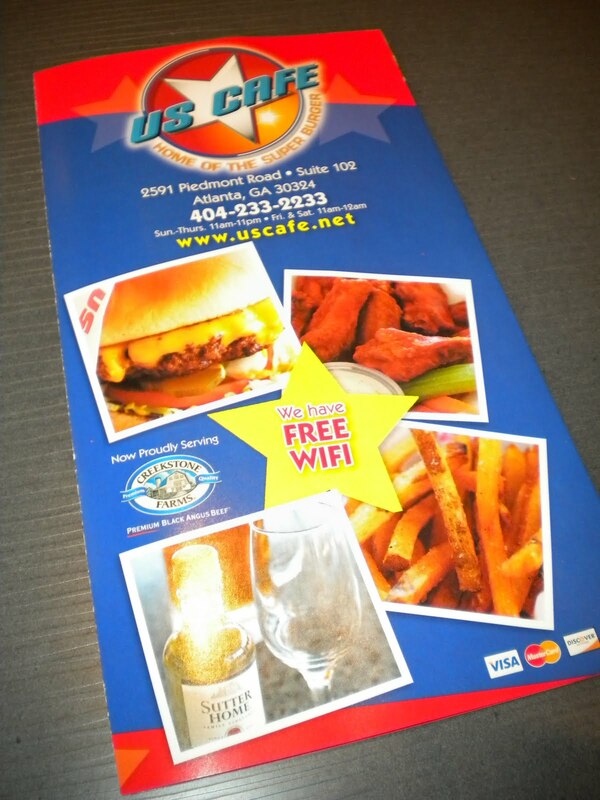 I was provided with a complimentary $10 gift certificate to check out US Cafe Buckhead. When I first received it, I was a little underwhelmed. What could $10 possibly get you? 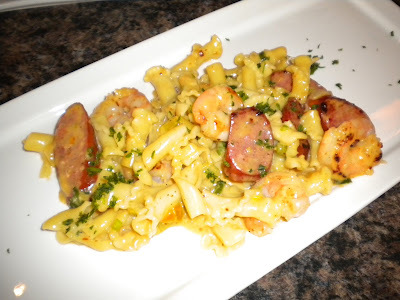 Well, it was a pleasant surprise to find that dinner for 2 can be as little as $15 - $20. Also, this place is neat, in that it has good quality burgers and wings as well as a full bar and pool tables in a smoke free environment. Quesadillas, salads and hot dogs are also featured along with turkey and veggie versions of the burger. I found the fries very fresh as well. I could see renting this place out for a party. 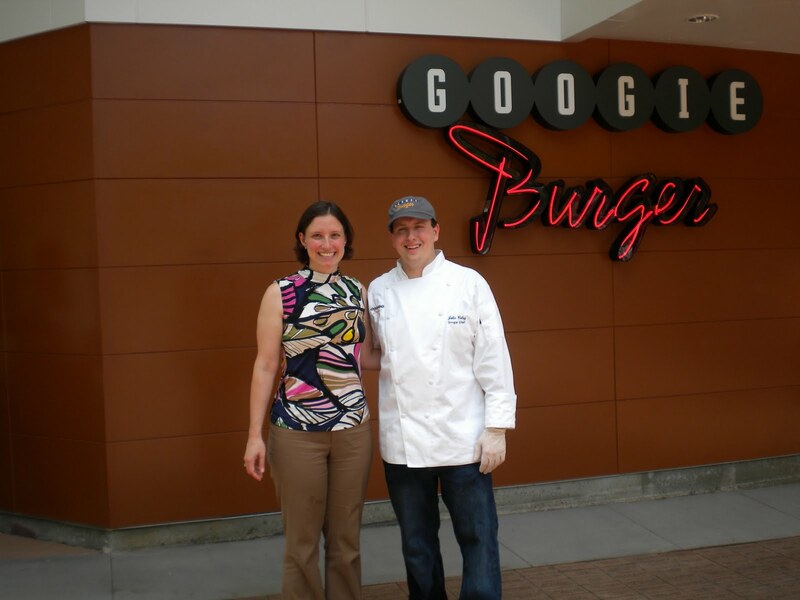 There are two other locations in Smyrna and South Cobb - regions where I rarely venture! Another tidbit that makes US Cafe stand out: the company supports the Bert's Big Adventure non-profit charity group that helps children with chronic or terminal illness go to Disney World. 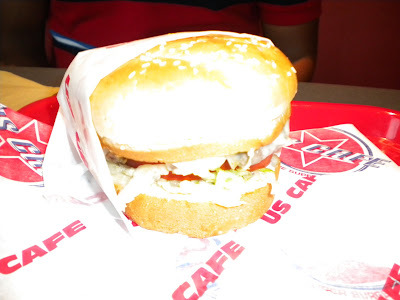 Cheeseburger - good beefy flavor. 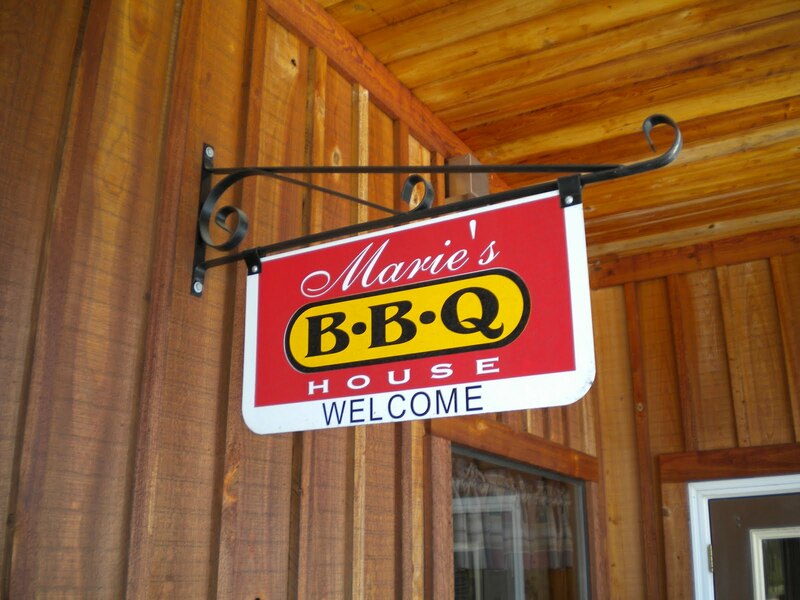 Famous ribs with pulled pork, slaw and beans. I finally had the opportunity to try the iconic Charlie Vergos' Rendezvous' famous dry rub ribs while on a family vacation to Memphis. 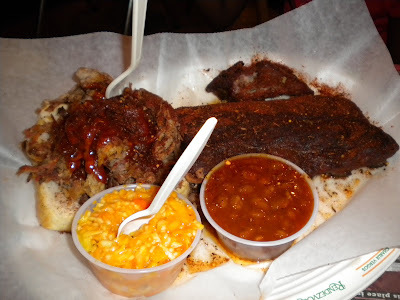 The ribs are really what it is all about here as the other items we tried fell flat. Don't bother with the pulled chicken or even the pulled pork. Get the ribs. Try both sauces. Enjoy the atmosphere. You'll thank me later. 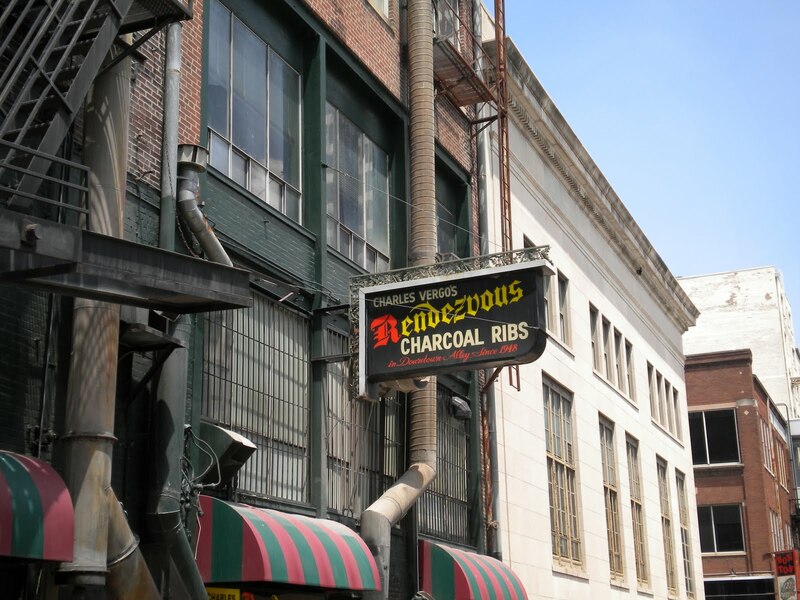 The baked beans and slaw are okay, but the side dishes are not what Rendezvous is famous for. They offer no fried foods so service is quick - we were in and out in about 30 minutes - a good thing since we'd parked the rental at a one hour meter! Pulled chicken sandwich - not impressive. Several weeks ago I was able to take some of my co-workers to Googie Burger's opening media event. Googie is inside downtown Atlanta's Centennial Park and provides a nice alternative to the nearby CNN food court. 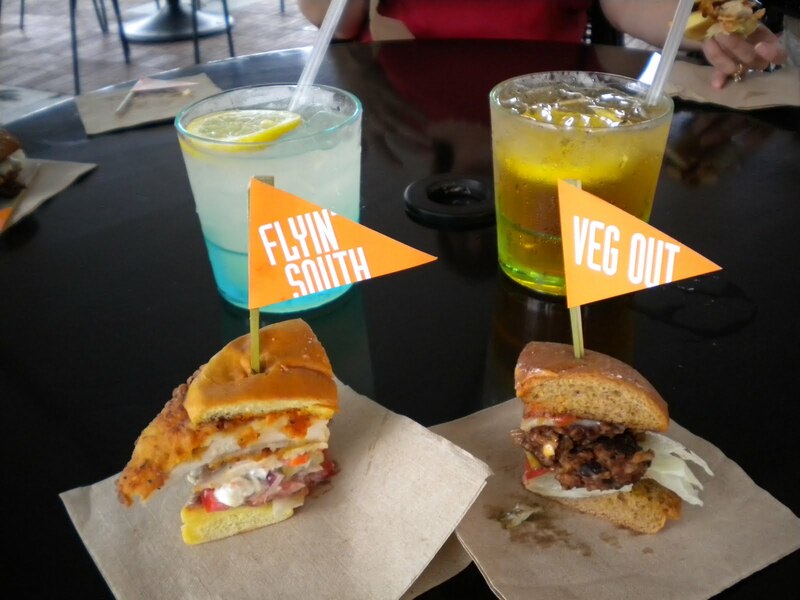 My favorites: the Flyin' South chicken sandwich and, believe it or not, the veggie burger. The chicken sandwich has a kick to it, with spicy batter, hot sauce and blue cheese slaw on top. A definite winner. The veggie burger was better than most renditions I've tasted, prepared in house and topped with BBQ sauce and pepper-jack cheese. The hand cut fries were not bad either. 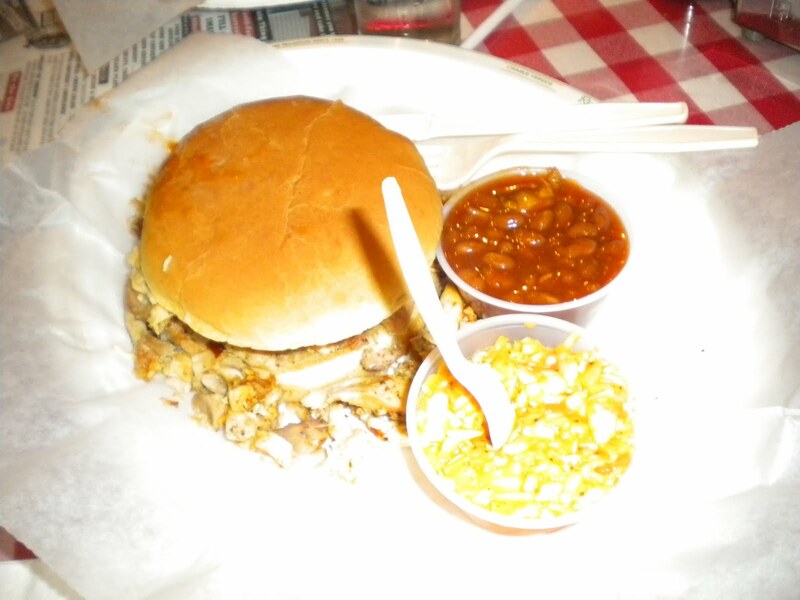 The burgers were tasty, too, although the beefy pig was a little too hefty for me, with smoked pork and bacon on top! One complaint from my entire table involved the iced tea: the sweet iced tea was too sweet, with little tea flavor and the unsweetened tea was watery, with little tea flavor. Some improvements should be made here. We did enjoy three varieties of milkshake: a perfectly passable vanilla, a delicious peach and a wonderful peanut butter and jelly, although not much jelly could be tasted. The PB&J tasted even better frozen at home and eaten like ice cream. 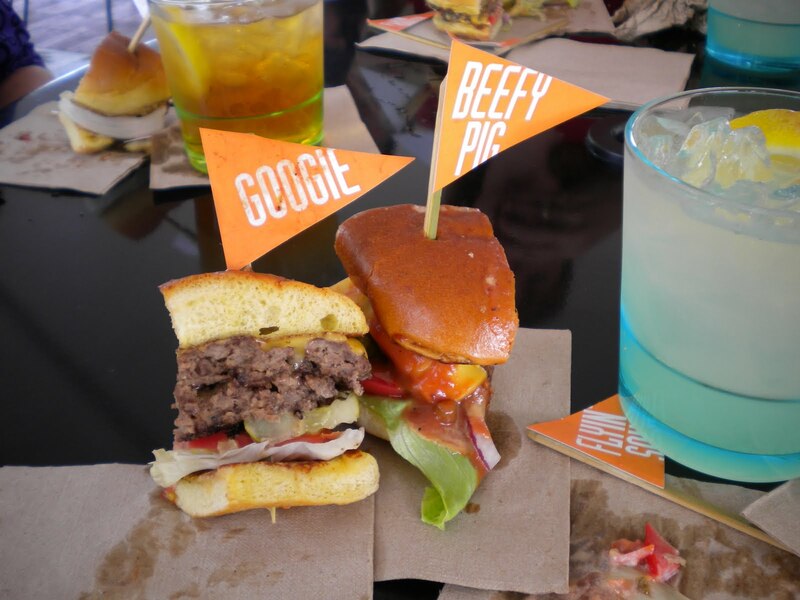 Googie also serves beer, wine and spiked milkshakes, a unique offering. Googie's name comes from a distinct type of architecture, which features a bold look and wild angles. 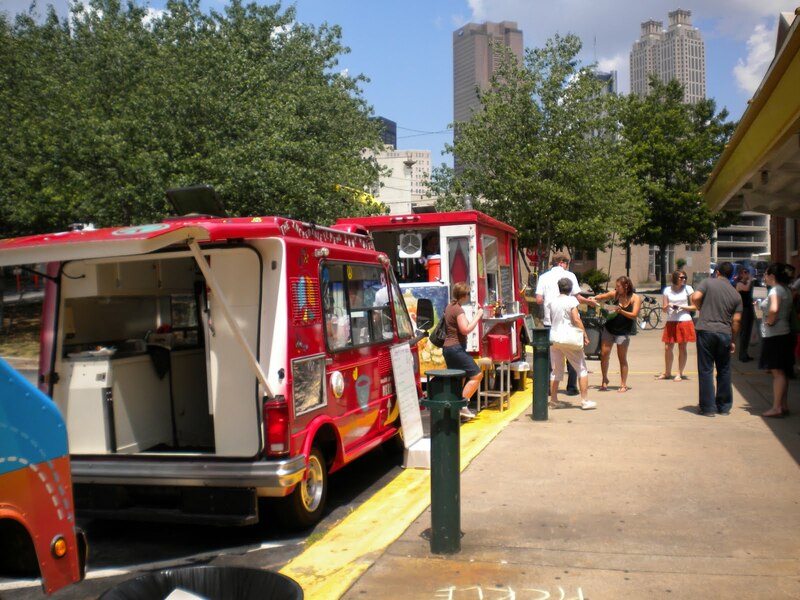 If you're in Centennial Park, you won't miss it! Yours truly with Googie Burger's chef. After winning tickets to Serenbe Playhouse's opening season (theater under the stars), Calvin and I ventured out the oasis that is Serenbe for dinner and a show. The Hil at Serenbe is one of the three restaurants open in the community. 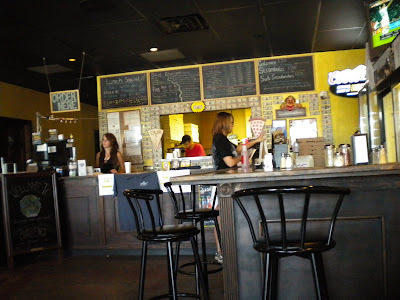 I dined there previously for brunch with my dad about a year ago, and included some photos of the planned community (see post here) in that post. This time we discovered a labyrinth and some farm animals including goats, a donkey and chickens near the small lake on the way to Serenbe's Inn. Dinner, albeit expensive, was quite delicious. I could have consumed 4X the amount of tomato salad provided it was so good. 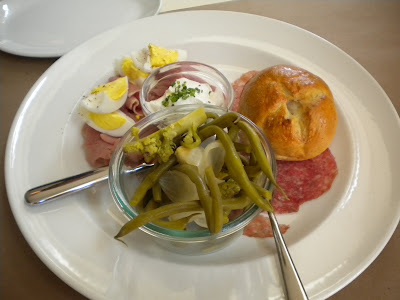 The antipasti plate pictured above also impressed, with local egg, homemade soft cheese, cured meats and pickled beans you really do feel like you're tasting the farm. The chicken, juicy and divine, provided a reminder of the simple joys in life. 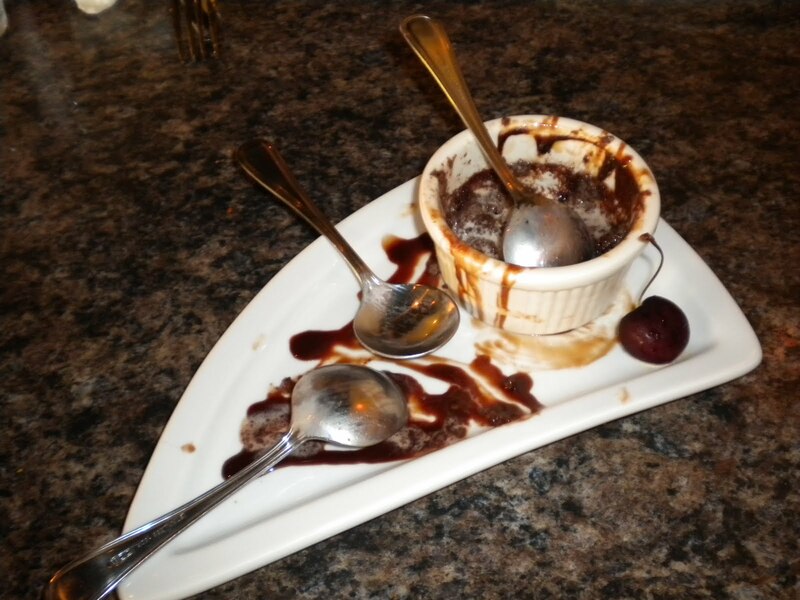 Of course we had to try dessert. 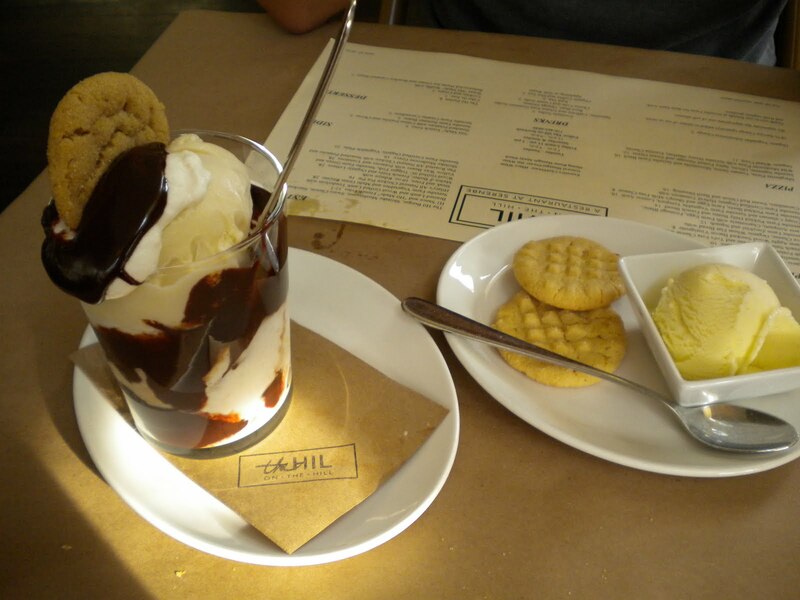 The parfait was a bit much with three kinds of ice cream, cookies and cookie dough with chocolate and caramel sauces. The cookies and cream - a perfect end to a simple, good meal. 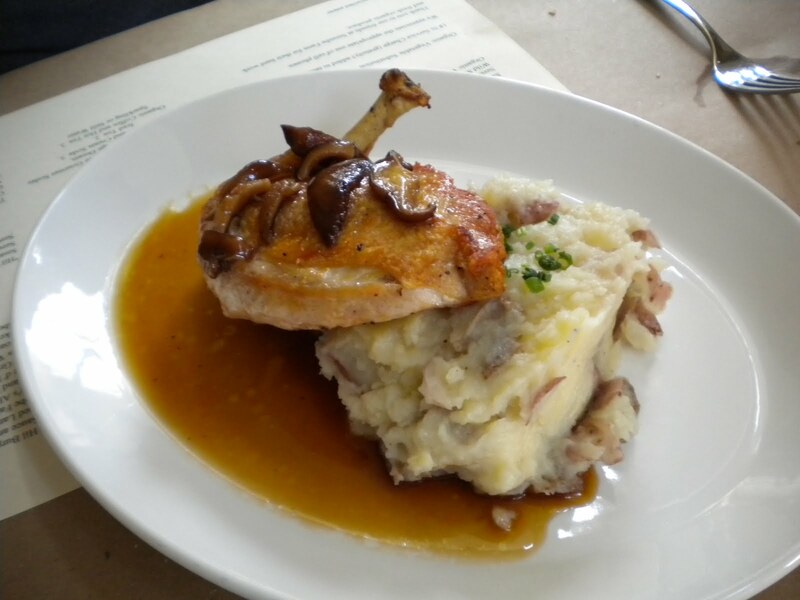 All-natural chicken with smashed potatoes. Sinful parfait (including raw cookie dough at the bottom) and the cookies and cream dessert (peanut butter with vanilla ice cream tonight). The sheer size of it - Calvin poses with the giant pizza! 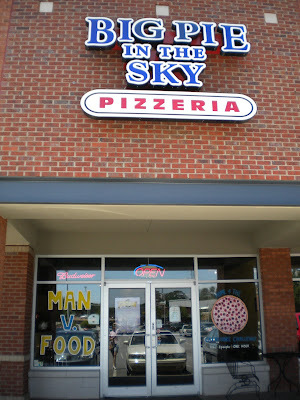 After a fun-filled afternoon of rock climbing with a group, we all decided to head to Big Pie in the Sky for some pizza. Man vs. Food attempted their Carnivore Challenge - 2 people have to eat 11 lbs. of meat-heavy pizza in under one hour for a $250 prize (the pizza costs $50) and did not succeed. Our group of 9 succeeded in finishing off the above pie, but did not even try the Carniverous wonder. The pizza actually tasted great. 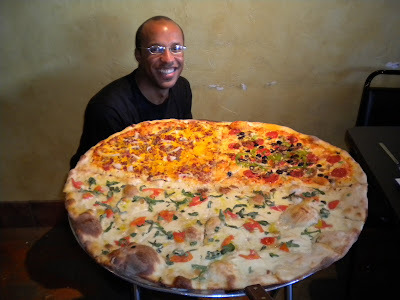 I was a little skeptical with a pie this large, but the bacon cheeseburger and the Margherita specialty pies really impressed. I'm not often in Kennesaw, but if you are, this is a must-try! 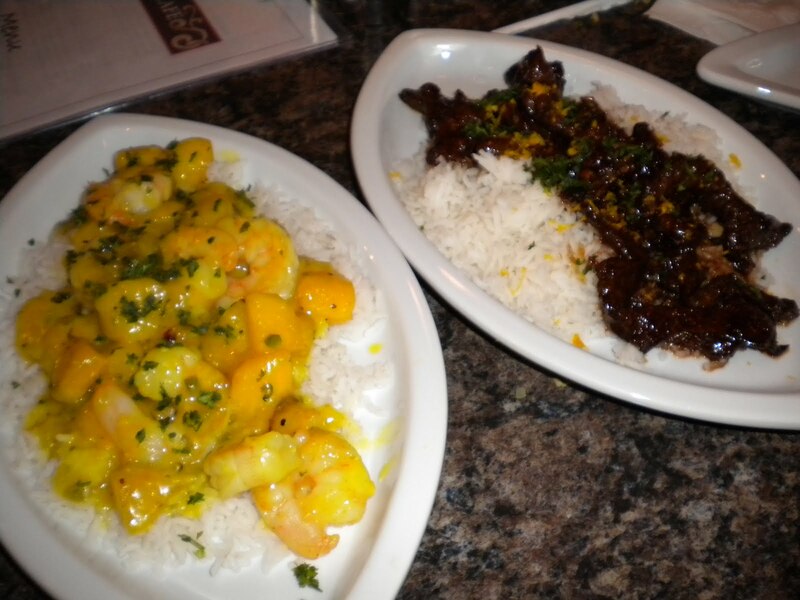 Swahili Shrimp Curry with Mango and Spicy Asian Orange Beef. Isabella's Cafe is a strong, unique addition to the Decatur dining scene. Located on West College Avenue, it's a bit off the beaten track of downtown, yet fully accessible and certainly worth seeking out. 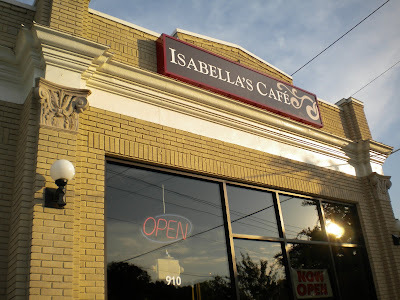 A couple of weeks ago owner/manager Wambui Maina invited me to sample much of Isabella's extensive, diverse menu. The menu's international focus comes from Wambui's own life experiences: born in Kenya, then lived in New Orleans, and traveled extensively around the US and the world. Photographs from around the world adorn the walls here, making for a full international experience for the eyes as well as the taste buds. The restaurant is named for Wambui's mother, Isabella. The moist, savory corn muffins provided to each table started things off right. 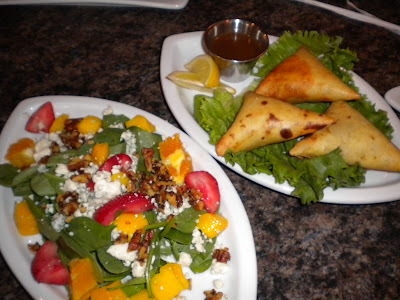 The trio of samosas - ground turkey was my favorite - also impressed, although I would like to taste a little more spicy heat in the mixtures. We also enjoyed two types of wings: tangy tamarind and sweet and hot Thai. Both were satisfying, but I enjoyed the sweet and hot Thai the most as the hot flavor really came through. Sounds like I'm on the lookout for spice these days... not sure what that means! The spinach salad was amazing. One of the best parts of the meal, and we were provided with all three homemade dressings: passion fruit vinaigrette is my top pick. I also loved the Swahili shrimp with Mango - a definite must-try. 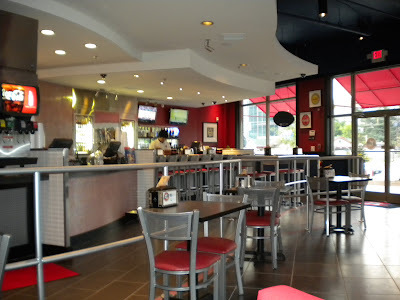 The spicy Asian beef was a bit too salty for my taste and a little too mainstream to stand out among all the other offerings not commonly found in Atlanta. 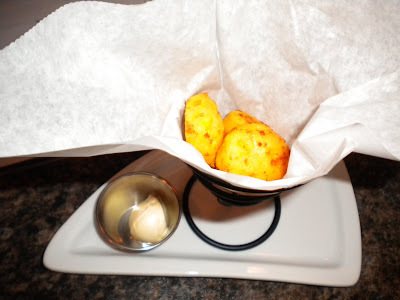 Corn muffins delivered to each table. 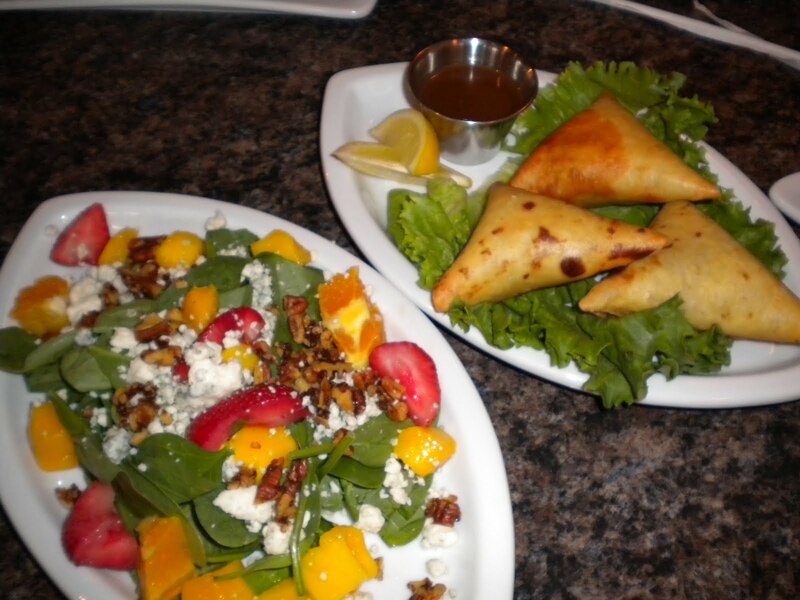 Samosa sampler platter and Spinach and Gorgonzola salad with mango, strawberries and spiced pecans. 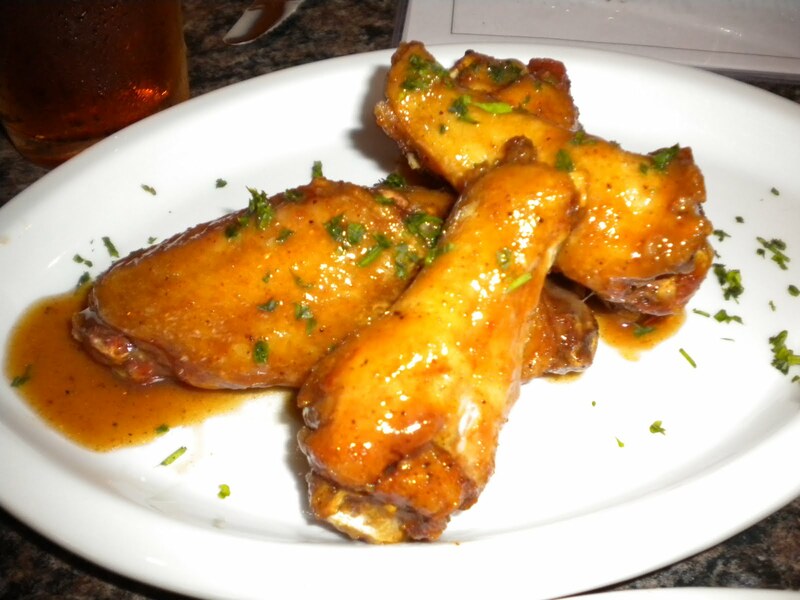 Rich and Tangy Tamarind Wings - we also tried the Thai Sweet and Hot Wings. Pepper-Jack Macaroni and Cheese and Chipotle-Maple Black Beans. 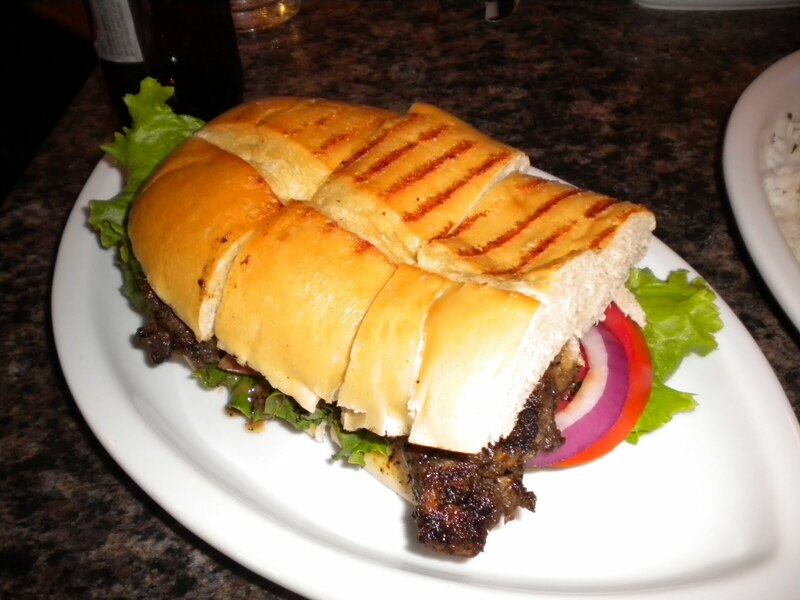 The jerk chicken sandwich was another hit - spicy and large, this would make a wonderful lunch. 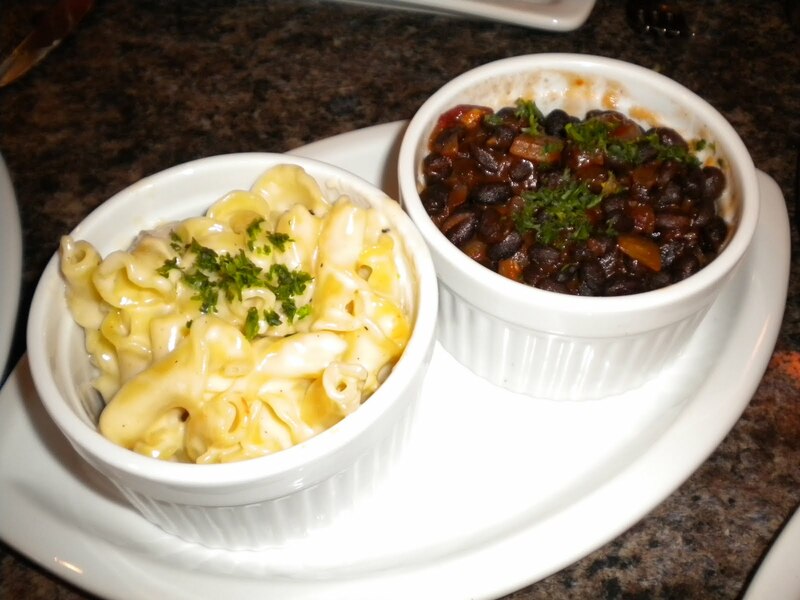 We also thoroughly enjoyed the mac and cheese and the black beans. The beans had a really unique flavor and I'm not usually one to like black beans. I would probably choose them over the other side choices next time they are so good! Cajun Shrimp and Andouille Sausage Alfredo over Pasta - also very tasty with just the right creaminess and spice. Cheesy Buffalo Chicken Balls with Blue Cheese. Another good appetizer choice, although I think I prefer the real wings. Still, for those who prefer boneless, this is a great choice. 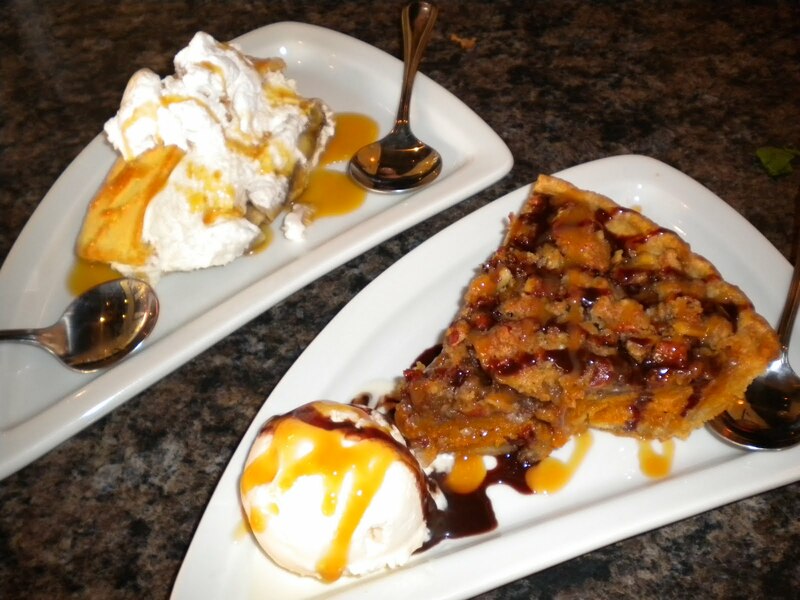 Banana Pudding and Sweet Potato Pie with Crunchy Pecan Topping. Both were great - loved the sweet potato pie. All that was left of our Warm Chocolate Molten Cake! Do you think we liked it?? Inside Isabella's. The dining room is actually much larger than this view of the kitchen area. 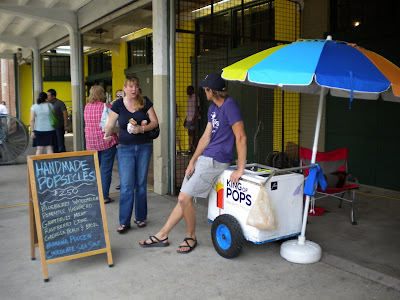 King of Pops' awesome popsicle cart. I LOVE the chocolate sea salt pop. The tangerine basil is also a winner and the Mexican chocolate has a unique spice. A few weeks ago Calvin and I had lunch together (a rare treat!) outside the Auburn Curb Market where the many street food carts vying to be allowed to operate around the city set up shop. Such a great idea - I really hope something changes and more carts are available around town soon. Like at the corner of Buford Hwy. and Lenox Rd. Please?! Korean tacos from Yumbii - the first truck granted permits to operate as a true street vendor - yay! Lining up for the Yumbii truck. Big burrito - a bit heavy on the beans for my taste. 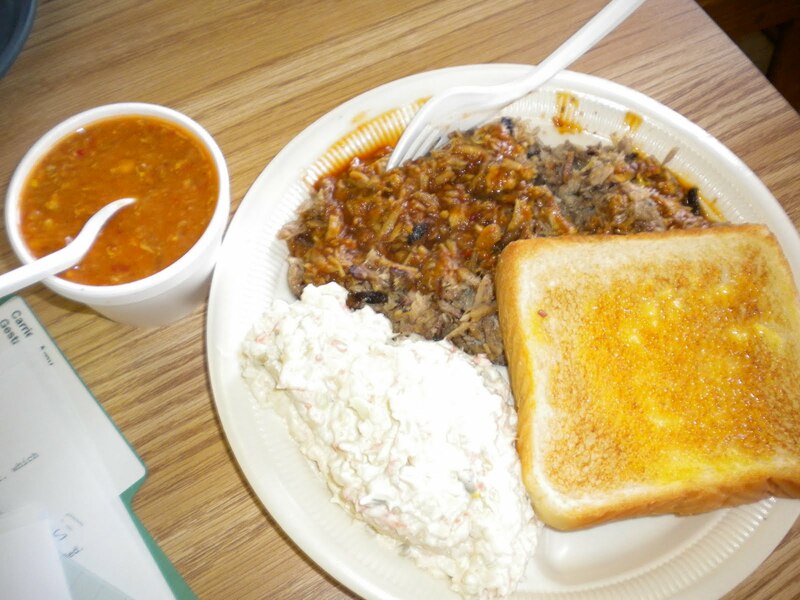 BBQ, slaw and Brunswick Stew. A few weeks ago I found myself meeting with someone for work in the middle of nowhere - midway between someplace in Alabama and Atlanta. 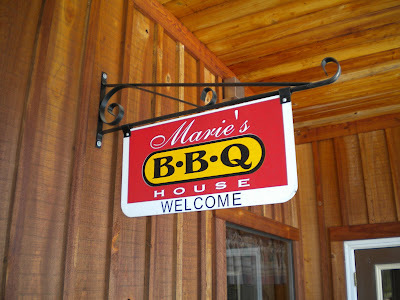 With a little research, I came up with Marie's BBQ House as a good meeting point. For this area, not a bad choice. I really liked the Brunswich stew more than the BBQ and wished I had ordered a bowl instead of the plate. The slaw contained too much mayo for my taste and the pulled pork was not memorable. They have homemade looking desserts, including something I've never heard of - a boiled cookie - but after eating the above I did not have room for dessert.